The government’s efforts to provide proper labour protection and welfare benefits to informal workers are moving at a snail’s pace, according to a leading researcher. 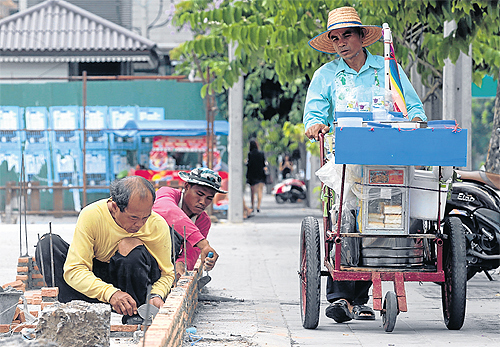 In recent years, workers in the formal sector have enjoyed many improved benefits, including an increase in the daily minimum wage to 300 baht, Yongyuth Chalaemwong, director of the Thailand Development Research Institute (TDRI), said. But for those in the informal sector little has changed, he added. They have missed out on schemes such as the Social Security Fund, which was set up to mainly serve workers in the formal sector, and the Workers’ Compensation Fund, which does not apply to temporary or part-time employees. As a result, informal workers miss out on the help they need when they experience a work-related accident or fall sick, Mr Yongyuth said. There is clearly a gap in the labour protection provided for workers in the formal sector and those in the informal sector, he said, adding that the latter group must be better supported. Mr Yongyuth urged the government to expand its social security welfare schemes to encompass informal workers. The number of people working on a casual basis as maids, or part-time in the fisheries and farm sectors, is rising, but they face a growing array of problems, he said. On a positive note, Mr Yongyuth said the Social Security Office is planning to hire the TDRI to study ways to extend its social welfare system to cover part-time workers. Yongyuth Mentapao, an adviser to the Thailand Autoworkers Federation and deputy chairman of the Labour Solidarity Committee, said the country’s labour problems have remained unresolved despite repeated calls to tackle them over the past 10 years. On Labour Day every year the prime minister hears workers’ proposals, but nothing has been done about any of them, he said.